Thanks to everyone in the Whistler Children’s Chorus and the Whistler Singers who came and sang at the Bratz Biz / Bizarre Bazaar. Many thanks to the Whistler Arts Council and Bratz Biz for inviting us to come and sing. Mark Saturday, November 30th on your calendars. Whistler Children’s Chorus and the Whistler Singers will be singing once again at the Conference Centre during this annual crafts fair presented by the Whistler Arts Council and Bratz Biz. Whistler Children’s Chorus and Whistler Singers will be performing two 30 minute sets at 1:45pm and 2:30pm. Singers, please meet by the stage in the foyer at 1:30pm to get ready. Looking forward to spreading festive and seasonal cheer through song! Many thanks to everyone who braved the weather and sang at the Municipal Remembrance Day ceremony in the village. It is great to see our community take time to remember and reflect. Municipal Remembrance Day Ceremony starts at 10:30am tomorrow! 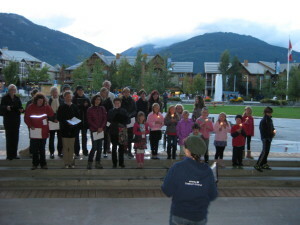 We’ll see all choir members (Whistler Children’s Chorus and Whistler Singers) at the fire hall in Whistler Village at 10:30am tomorrow. Dress weather appropriate and remember to wear your poppy. Thanks to everyone who braved the cold to come out and sing to acknowledge the United Nations International Day of Peace. It was windy at the Olympic Plaza but the choirs sang beautifully. Thank-you to Caterina Alberti for organizing this annual ceremony.